Families living in the Jijiga refugee camps suffer from energy poverty at its most extreme. Already high levels of environmental degradation are exacerbated by fuelwood collection. Increasing deforestation forces refugee women and girls to travel greater and greater distances in search of already scarce resources, leaving them vulnerable to violence and injury. Gaia became an official implementing partner of the United Nations High Commissioner for Refugees (UNHCR) in 2005 and administers the organization’s Safe and Clean Household Energy Program. Gaia’s commitment to bring modern stoves and fuels to households in the camps provides clean energy to thousands of refugee households each year. 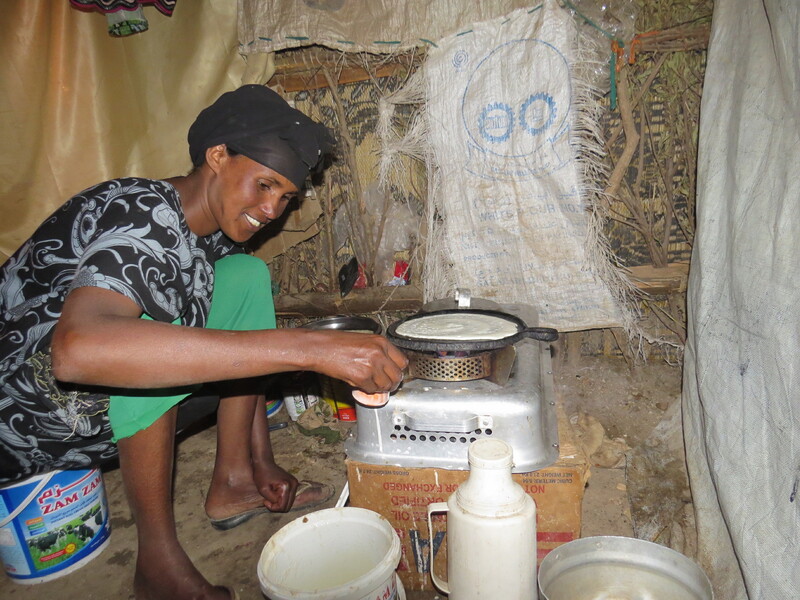 Today, Gaia covers 100% of families in Eastern Ethiopia’s Jijiga camps (Awberre, Kebribeyah, and Sheder) with clean stoves and fuel. To date, the humanitarian program has distributed more than 7,000 clean cookstoves and over three million liters of ethanol. Gaia is working diligently to scale up its humanitarian efforts and embraces all of the fuels and stoves that make this possible. In 2016, Gaia launched a new program with UNHCR to test and evaluate different cookstove technologies in Melkadida camp in Dollo Ado. Since Melkadida’s establishment in 2011, domestic energy provision has constituted a major concern. Melkadida suffers from the absence of long term sustainable energy plan leaving its residents to suffer from energy poverty in its extreme. Refugees have been forced to adopt negative coping strategies, either selling part of their food rations for fuel or exposing themselves to protection risks to collect firewood. Moreover, the harsh environmental conditions have provoked conflict between the host community and refugees, both of whom must compete for limited natural resources. This reality spurred a new partnership agreement between Gaia, UNHCR and the Administration for Refugee and Returnee Affairs (ARRA). The resulting program will test six different cookstove types and evaluate fuel supply and demand. The stoves and fuels to be tested include: ethanol stoves, two types of rocket stoves (wood fuel), two types of briquette stoves (charcoal) and kerosene stoves. The study will consider a variety of factors, including health, safety and protection indicators, user preference, affordability, environmental and socio-economic impact analysis. Gaia believes that a paradigm shift from wood fuel to alternative energy sources is necessary to increase energy access and to improve the health and security status of refugees. Fact: In many countries, women and girls can spend up to 20 hours per week collecting firewood.